Welcome to the Knowledge Domain! 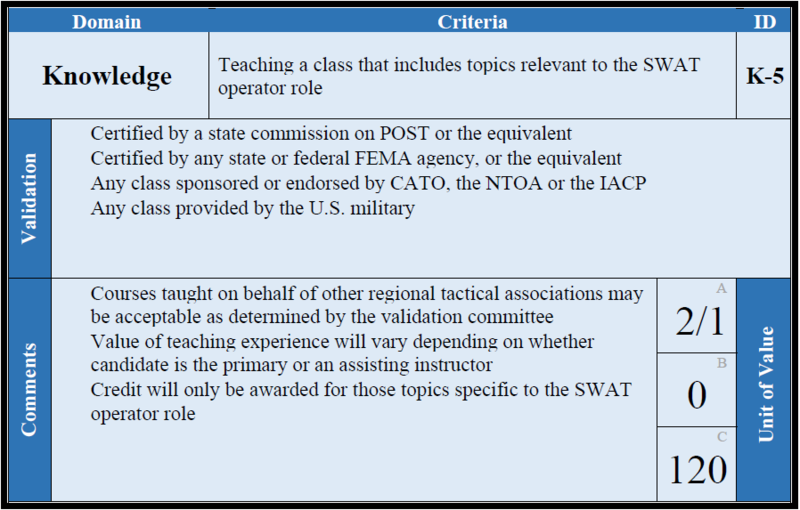 This domain focuses on your personal knowledge related to the role of SWAT Operator. When considering competence and expertise, knowledge is the most-well known factor. The most common understanding of knowledge is a combination of learning and reasoning, often accompanied by a particular skill. It refers to the factual information that enables a person to comprehend the nature and recognize the significance of something. Facts, information and skills are of no value unless a person knows what to do and why it is important. Notwithstanding, knowledge, in and of itself, is insufficient to identify competence, especially in the complex role of SWAT Operator. Hence, this domain is only one of three necessary to achieve successful accreditation. There are five criteria in the Knowledge Domain, one of which is mandatory. 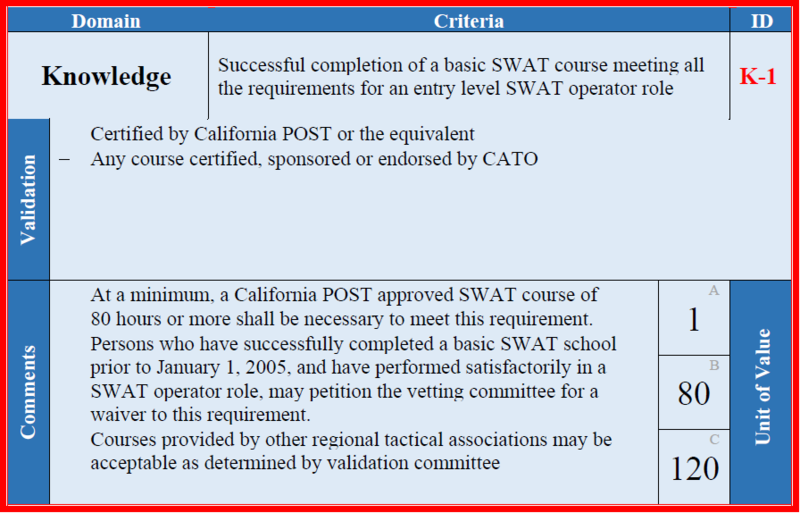 You must achieve at least 100 points in this domain, including the successful completion of a basic SWAT course. You may attain additional points by completing elective criteria. Review the worksheets in the Knowledge Domain for a detailed explanation for how points are awarded, as well as information on grading, validation, repeatability and other information that will be used to assess the amount of points awarded. The worksheets may be examined online or downloaded for your convenience. This criterion is mandated. Regardless of successful completion of any other criteria, certification requires that this criterion be successfully completed. This criterion may not be repeated for credit. This criterion is the “base unit of measurement” and has been determined as one hour of subject specific training. This metric is used to assess the contribution of all other criteria, which are valued in increments of this one. A — Assign a unit of value of “1” for each hour of a course meeting all the requirements of the specific role. B — The minimum number of units of value required for this criterion. C — The maximum number of units of value allowed for this criterion. This criterion is optional. 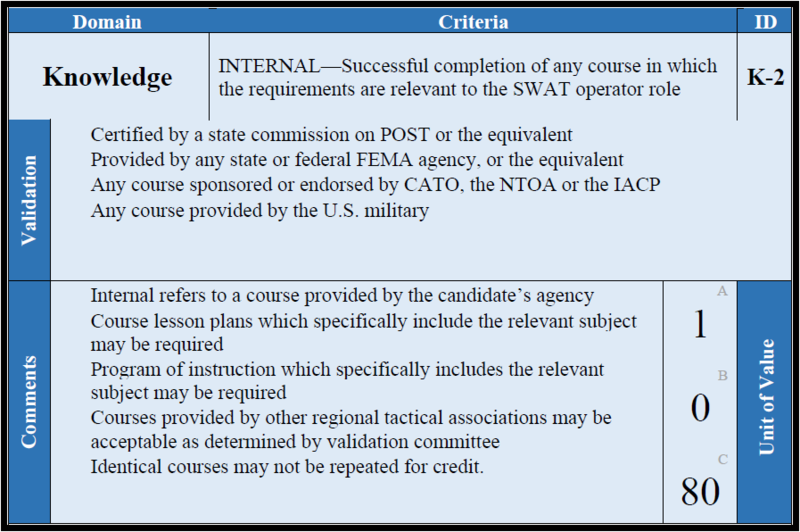 It is not necessary for a candidate to complete this particular criterion for certification. 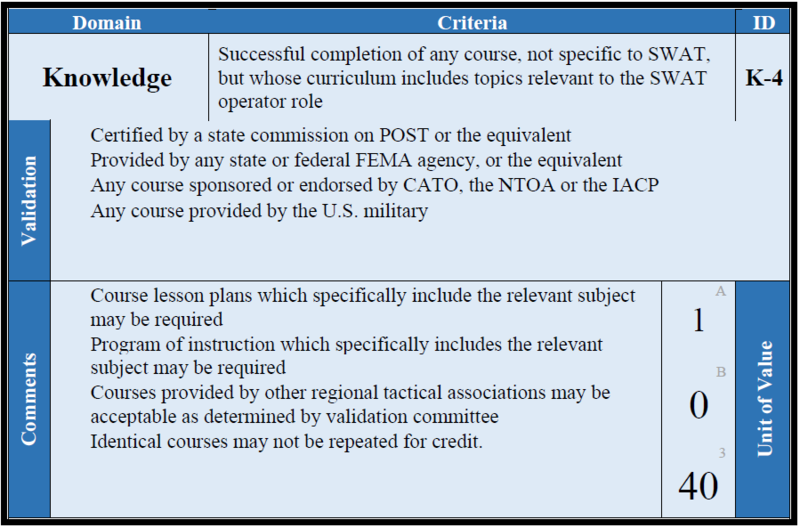 This criterion is intended to recognize relevant training and education beyond the entry-level SWAT operator school, for example, a course on high risk search warrants, hostage recovery, or barricaded suspects. A — Assign a unit of value of “1” for each hour of the portion of a course focused on the specific role. B — The minimum number of successful repetitions this section may be repeated for credit. 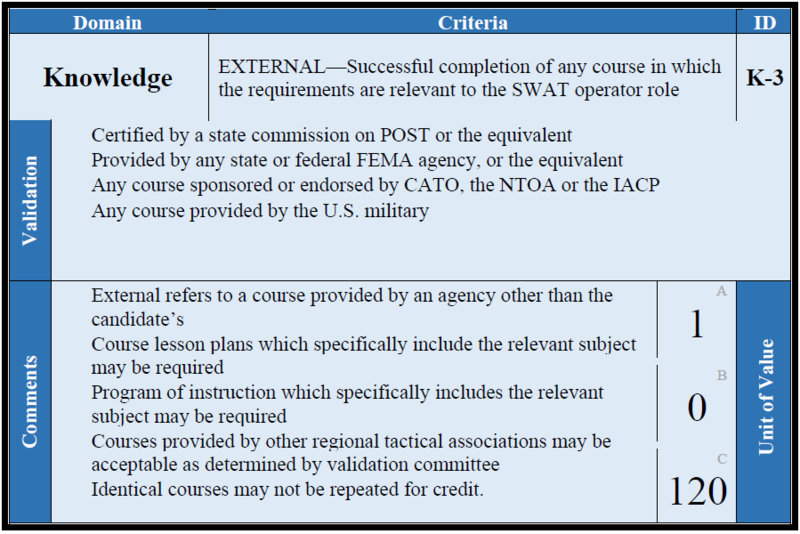 This criterion is intended to recognize relevant training and education beyond the entry-level SWAT operator school, for example, a course on high risk search warrants, hostage recovery, or barricaded suspects. This criterion is intended to recognize the contribution in which a particular role is included as part of another class, to include practical applications, demonstrations, and exercises. As an example, this might occur when a course or exercise on evacuations includes topics like command post operations, containments, fields of fire or other SWAT specific subjects. It has long been recognized that one of the best ways of learning something is to teach it. Teaching requires an individual to be well-versed in the subject, as well as organizing the instructional material and presenting it in a meaningful manner. This criterion recognizes the contribution of gaining knowledge, skills and/or abilities by teaching a specific subject, whether as the primary instructor, a secondary instructor, or an assistant or safety officer. A — Assign a unit of value of “2” for each hour teaching a course as the primary instructor or “1” for each hour teaching a course as a secondary or assisting instructor or as a safety officer.